The Sydney International Boat Show is held at the Sydney Convention and Exhibition Centre and Cockle Bay Marina in Darling Harbour. Darling Harbour is a vibrant entertainment precinct in the heart of Sydney and only 25 minutes drive from the airport. This stock image shows Sydney CBD and Cockle Bay at twilight. This image belongs to the travel and nature stock photo library. This stock photo of Cockle Bay Marina Hosting International Boat Show is available for licensing for commercial and editorial uses including websites, blogs, books, magazines, brochures and advertising. Restrictions may apply for images which contain third party copyrighted material or sensitive subjects. Photos of artwork are for editorial use only. 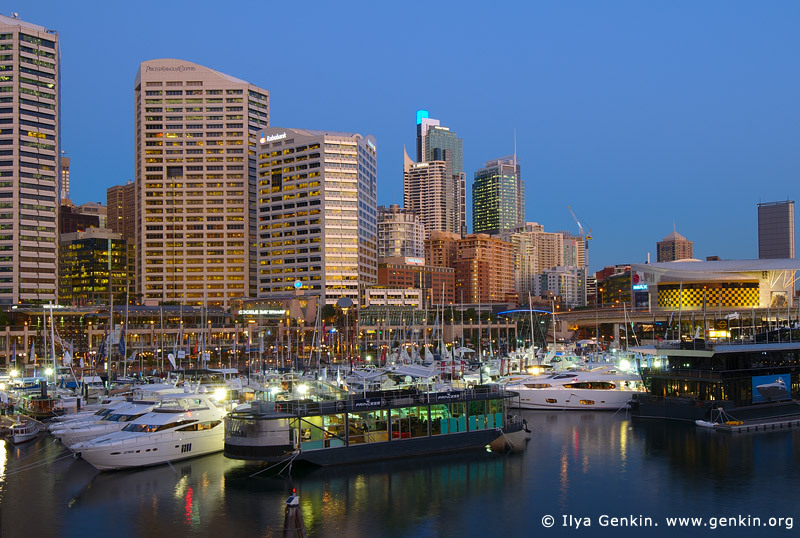 This image id AU-SYDNEY-0005 of Cockle Bay Marina Hosting International Boat Show, is copyrighted © by Ilya Genkin. This is not a public domain image.